There's something fishy about that well-dressed man. Octodad: Dadliest Catch finally reeled in a PlayStation 4 release date, scuttling onto Sony's next-gen console this coming Tuesday, April 22. Young Horses' suit-sporting cephalopod will be priced at $15 USD, though PlayStation Plus users can dive into the action during the first week for just $12, netting them a $3 savings. "We started Octodad as a ragtag group of students, and it’s been a long and crazy ride getting our silly game on the PS4," wrote Kevin Zuhn, creative director of Octodad. "We’ve taken the time to improve it based on feedback from our players." The PlayStation 4 offering has also hooked additional content, stowing more deck-swabbing, jig-dancing, and disguise-wearing challenges than originally included in the PC release. 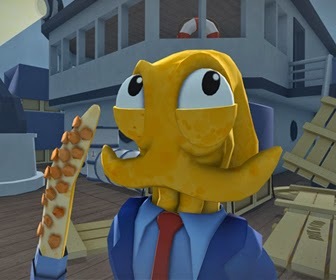 With a new local co-op mode, players can each captain one of Octodad's tentacles and work together in an attempt not to flounder all over the place. Lastly, the PS4 port will sail onto the marketplace with added support for console-specific controller configurations, such as a PlayStation Move, or two.